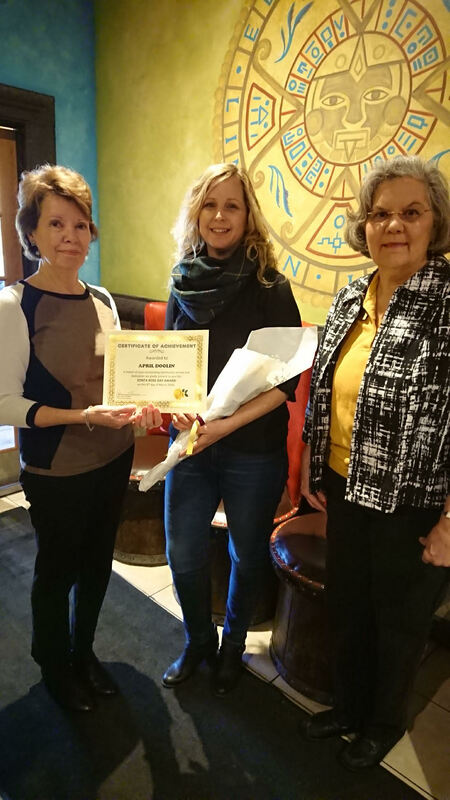 Each year on March 8 in recognition of International Women’s Day, the Zonta Club of Lincoln celebrates “Yellow Rose Day” by honoring women from Logan County for their achievements and/or dedication to the community. 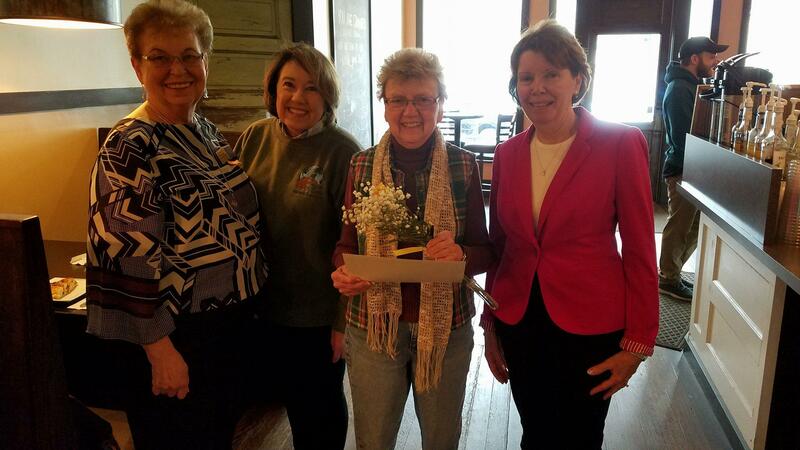 This year, Zonta Club members Renee Dreusicke, Connie Dehner, and Chris Huff presented yellow roses to April Doolin, Patricia (Pat) Snyder, and Verdeen Ingram. Please join us in thanking these women for their hard work and dedication to our community! The Club honored April Doolin for her leadership and involvement with various community activities including Integrity Holdings whose focus is on revitalizing downtown Lincoln through the renovation of aging buildings; the Historic Preservation Commission of Lincoln; and the Harvest of Talents for World Hunger Holiday Homes Tour. April was key in the development of the Land of Lincoln CEO Program, which is an entrepreneurship education program for high school students, and she was also the founder of the Young Professionals of Lincoln. Pat Snyder, now retired, served as a local attorney’s trusted secretary as well as executive secretary to the President of Lincoln Christian University. She was a longstanding Sunday School teacher and workshop leader of ‘Leaving Your Heartprints’ and ‘Sharing the Harvest’. Thirty-five years ago, after watching a television commentary on world hunger, Pat had an idea to ‘harvest’ the many talents of people in our community for the sake of sharing our blessings with those in unfortunate circumstances. Her original idea founded the giving process that our community well knows as “Harvest of Talents for World Hunger.” Her idea was not only embraced by the Lincoln Christian Church community and became an annual event on the fourth Saturday in October, but years later the Mayor of Lincoln also proclaimed this same Saturday every year to be “Harvest Day in Lincoln.” Pat’s vision gave way to many other community activities reflecting the talents of those involved to raise funds – 100% of which are given for hunger relief. Lincoln’s Harvest of Talents has raised over $2,239,735.82 for hunger relief in 28 countries, including the United States. Under Pat’s guidance, the Harvest of Talents has grown from a local church effort to a community-wide event that now has eight sister Harvests in Illinois, Indiana, Kansas, and Tennessee. Verdeen Ingram is married to Larry Ingram with two grown children, Shanda (J.D.) Ryer and Orry (Becky) Ingram. 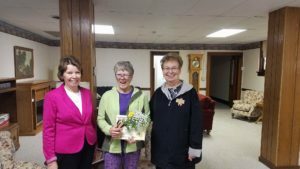 She is a lifelong and very active member of St. John United Church of Christ, where she is involved with the Bell Choir, Chime Choir, and occasionally sings with special groups. Verdeen is currently serving on the Church Council and is co-chairman of the Mission Committee. She has been instrumental in purchasing coats for kids for CAPCIL with St. John’s Thanksgiving offering, purchasing school supplies that may be needed, organizing Toys for Tots projects, collecting food items monthly to donate to the CAPCIL Food Pantry (along with a Thanksgiving Food Drive in November), and the recycling program at St. John UCC. Verdeen has been an active member on the CAPCIL Board since 1994 and participated in several committees including the Fundraising Committee as well as the Cheeseburger in Paradise event. She is the current chair of the Resource Development Planning Committee that assists with program evaluation and improvement. She volunteers several times per month, delivering meals to homebound seniors in Logan County through the “Meals on Wheels” program and she is an active ‘Guest Reader’ in the Head Start classrooms. She has also been involved with Up in Smoke on the Square for more than 4 years overseeing the kids’ “Q” competition, which offers a fun way for youth ages 7-11 and 12-15 to participate in a hamburger-grilling competition.